It has been a little bit since the Tutti Frutti CAL ended, but I have been away so haven’t had the chance to share the winners on my blog until now! This CAL was so much fun. Participants could either make one of my new berries or Bill the Pineapple as an entry into a draw to win some prizes. You can check out all the entries on ravelry in the CAL thread. I was super impressed with how many fruit amigurumi were made! And of course with how adorable they were. To determine the winners, I numbered all the entries and then used random.org to draw 3 numbers. The first number won a hook from HeartSprinkle and a hookabee pattern, while the next two numbers each won a hookabee pattern. 3rd Place: Wendy with her Dave the Blueberry! 2nd Place: Carrey with her Bill the Pineapple! 1st Place: Michaela with her Meg the Raspberry! Thank you to all who participated and for cheering each other on. 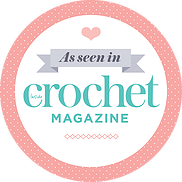 Also a big thanks to Krystle of HeartSprinkle for providing a super fun prize – a crochet hook with a custom handmade handle. Now to think about the next hookabee CAL…yay! Next > Ami-Along CAL and KAL: the 2016 edition is here!